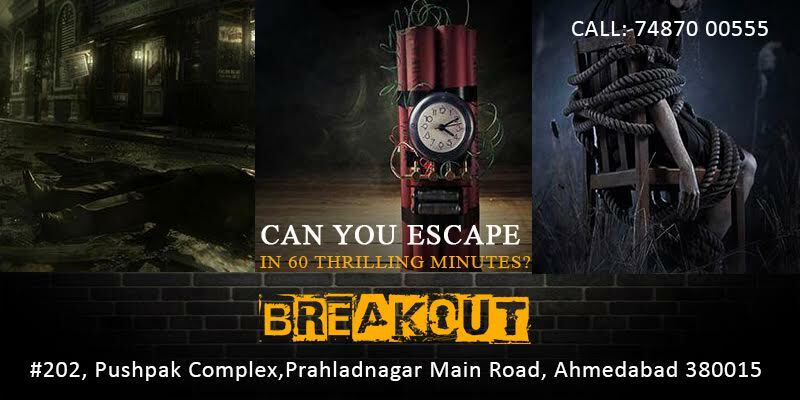 Breakout® is India’s premier Escape Game provider with a first and only one-of-its-kind “Movie based Experience” in which teams come together to embark on an exciting adventure of mystery solving. Ever imagined donning the hat of your favorite character Sherlock Holmes to crack a murder case? Have you desired to be tagged as a ‘Real Hero’ by being part of a rescue mission? Or did you yearn for a chance to be a Super Cop on an assignment to diffuse the bomb in the middle of a city? Breakout gives you a chance to do exactly that! India’s only movie-styled Escape Experience is nowhere in Ahmedabad. You, as a team, are on a mission! Can you find and decipher the clues hidden at the most unlikely of places or staring right at your face and solve the mystery? From posing a serious challenge to your reasoning ability to quenching your thirst for gripping adventures, the game does it all in just 60 minutes. If you are one who loves doing something exciting, you got to check this out. And what’s more, this is so much fun! Come, flex your brains and inject them with a new lease of life! Venue Images and Past event images are attached below. Further details can be found on our website. Kindly revert for doing the needful.